Steve Nogas ripped out an awesome burnout at Melbourne Autofest in his Killer Bee aka "KILLA-B - Bumblebee's evil brother" Chevrolet Camaro. 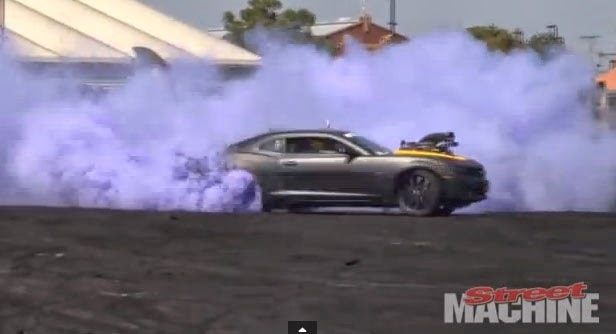 This maybe the coolest burnout video we have seen yet. Decepticon or Autobot? You decide. This 2010 Camaro is in Austraila, converted to right hand drive and all, started as a Yellow V6 car. Exterior is covered in a 3M Designer Wraps matte black. The car was officially released at the Meguiar's MotorEx 2012 at the Sydney Olympic Park.